Twiggy as handcrafted wearable art. I absolutely adore Twiggy Mannequins and am fortunate enough to own two of them from the 1960’s and 1970’s. 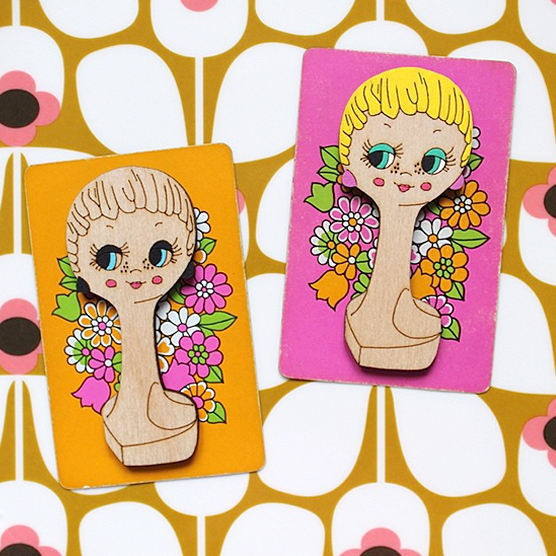 Both my girls were the models for my illustrations which became my Twiggy Head Brooches. The original Twiggy mannequins were based on the famous fashion model and used to display hats and scarves in trendy french fashion boutiques, however mine now reside in North London and are usually seen sporting flower halos! 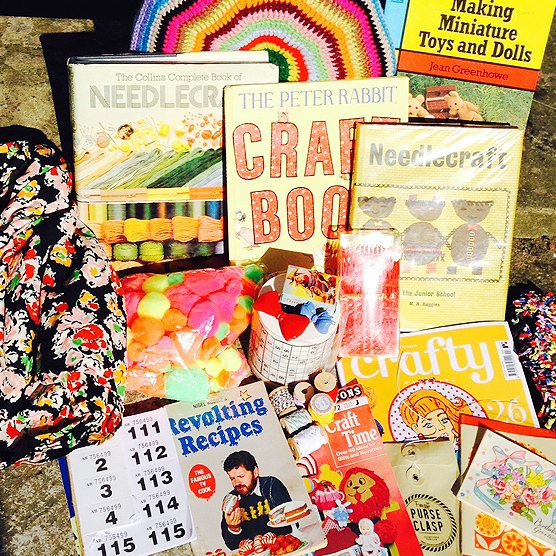 Crafty haul from Princess May School. When I first moved to London, I worked as an unpaid intern for stylists and magazines so I paid my way with lots of bar work and selling my thrifted treasures at Portobello Market. The main three boot fairs I sourced stock from were Kilburn Park School, Chiswick School and Battersea boot sale. All three fairs are still absolutely fantastic and recently the organisers at Kilburn have opened up a boot sale in my neighbourhood at Princess May School. I pop along to Princess May every few weeks and like ALL boot sales it can be hit and miss but the other week I met Buzz who used to run the shop All the Fun of the Fair which she had closed down and was offloading the remaining stock. 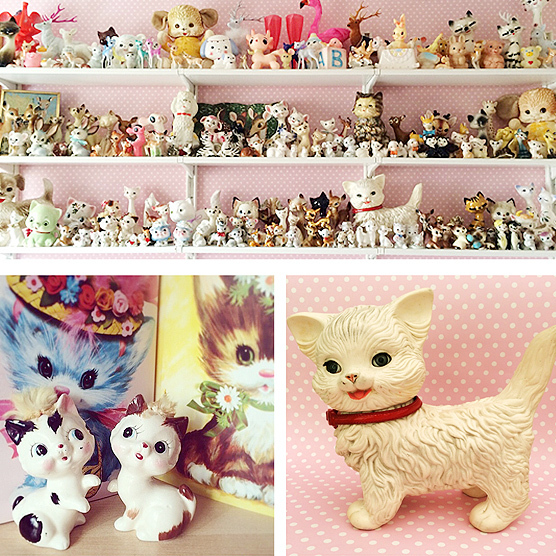 My crafty haul is pictured above! I also buy a lot from stylists, designers, artists, vintage vendors & independent shops having a clear out. That’s what I love about car booting in the capital. If you’re in this neck of the woods then you should also check out Capital Carboot and Wimbledon Greyhound track and don’t forget to haggle (with a smile)… happy thrifting! Sissy’s girly bright yellow outfit and Martin’s James Dean get up. 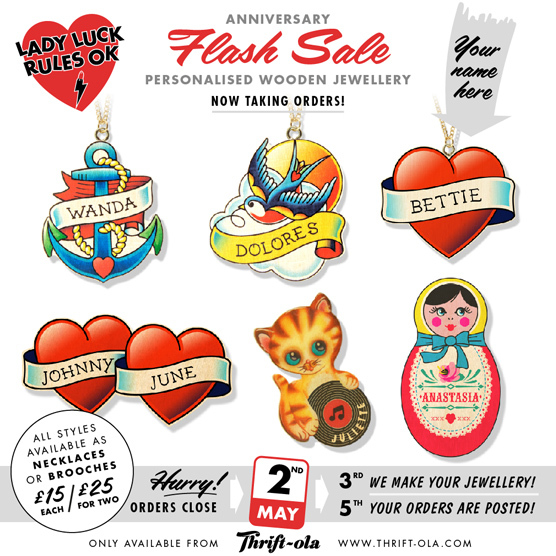 LLROK flash personalised jewellery sale! I’m super excited to announce we’ve brought back six of our best selling and much loved personalised wooden jewellery designs! You can order any of the styles above with the wording of your choice as necklaces or brooches with silver plated or gold toned fixings. Midnight Friday 2nd May :: Orders close! Saturday 3rd / Sunday 4th May :: We make your jewellery! Monday 5th May :: Your orders are posted! I have also added a little deal for those of you who want a couple of pieces and you can buy two designs for £25. Yay! We have only cut a limited number of wooden shapes so make sure you don’t miss out. We might make this an annual sale but you definitely won’t be able to order these again this year. If you have any questions please comment below or email me leona@thrift-ola.com and here’s a link to the collection in the shop.